I read this article and found it very interesting, thought it might be something for you. The article is called His Holiness the Dalai Lama is Doing Fine and Discharged From Hospital and is located at https://tibet.net/2019/04/his-holiness-the-dalai-lama-is-doing-fine-and-discharged-from-hospital/. His Holiness the Dalai Lama making his way out from the Max hospital after successfully recovering from a chest infection. New Delhi: His Holiness the Dalai Lama had to leave for Delhi on the 9 April from Dharamshala due to a chest infection. The symptoms of the infection were present from the time he was giving the teaching in Bodh Gaya last December but the infection was not diagnosed until this week.After a thorough medical examination and treatment, His Holiness the Dalai Lama has recovered brilliantly. He had his medication and enough rest at the hospital until this morning. His Holiness is now discharged from the hospital and moved to a Hotel. His Holiness will have his further medication performed at the Hotel and will be taking rest for a few more days in Delhi. 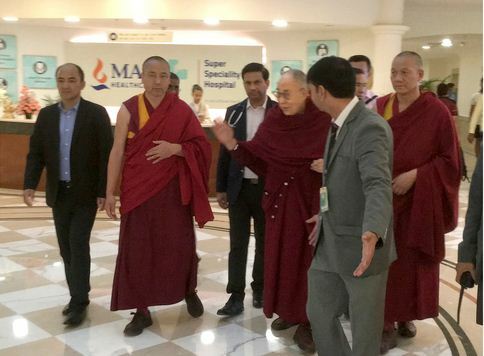 His Holiness assured that he feels almost normal as he leaves the hospital and thanked all the well-wishers across the world for their wishes and prayers for his speedy recovery. “Now almost normal”, His Holiness the Dalai Lama assured. Tibet News Bureau inquired about His Holiness the Dalai Lama’s health to Kasur Dongchung Ngodup, Representative of Bureau of His Holiness, New Delhi. According to him, His Holiness’s health has been restored and he looks refreshed. Addressing the media, His Holiness once again thanked Tibetans inside and outside Tibet for their prayers and wishes which has definitely helped him recover faster.